Almost every day, we are asked “what can I do to help?” Every contribution—whether it’s taking part in a community event, looking out for someone being bullied, or raising awareness through conversation—makes a difference and changes lives. In addition to individuals around the world sharing information about PACER resources, we receive heartfelt contributions of as little as five dollars from California to Maine, from Argentina to Norway and all around the globe, from donors ages 5 to 90. As damaging as bullying is, there is hope, because bullying is an issue that can be prevented. When teens unite it means one less student being bullied, one more person speaking out, or another young person knowing that they are not alone. Looking for ways to get involved? Explore the items below on our suggested “to-do” list. Show that you are united for kindness, acceptance and inclusion. This free, colorful, and informative 8 ½ x 11 (2-sided) flyer outlines the creative resources, outreach activities, and opportunities available from PACER’s National Bullying Prevention Center, which is the organization which created and manages the Teens Against Bullying website. Distribute at your local event, activity, or fundraiser. The “TeensAgainstBullying” bookmark for middle and high school students invites students to “Be A Champion Against Bullying”! The other side features eight different teen images. The TeensAgainstBullying packages will contain approximately 100 bookmarks of random quantities of each of the 8 images. Please allow two weeks from date of order for delivery. Tell an adult at your school about a free curriculum to prevent bullying and promote kindness. 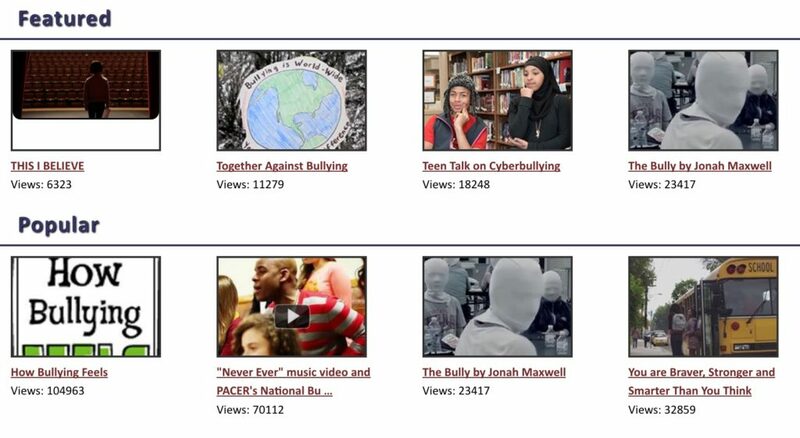 A collection of videos (located on our National Bullying Prevention Center website) which are created by us or for us, along with a few sent in by our audience. All are curated around content themes of bullying prevention, kindness, acceptance and inclusion. Celebrating those creating a world without bullying! These awards celebrating those creating a world without bullying. Nominations open in the spring (usually around February) and are submitted by individuals around the country and have included teachers who have touched the lives of students, individuals or groups who have been active in their communities, and those who simply made someone feel that they were not alone. Additionally, The Faces of Change Awards are presented to individuals or groups making a difference in Minnesota, where PACER’ National Bullying Prevention Center is located, and in the Los Angeles area, where NBPC maintains an office. There are many opportunities to take action as an individual or at your school or community using these resources from PACER’s National Bullying Prevention Center.